Earlier in the week I bought a few too many Coorong mullet fillets and we weren’t able to eat them all in one go (er, strictly speaking, we weren’t able to fit them in the pan all in one go – I’m sure if we tried we’d have been able to eat them all up!). Rather than just pan fry them again I wanted to do something a bit more warming and filling. I’m not going to complain about Adelaide’s weather again (especially not as it was 22°C yesterday) but we did need something more substantial than just a bit of pan fried fish! 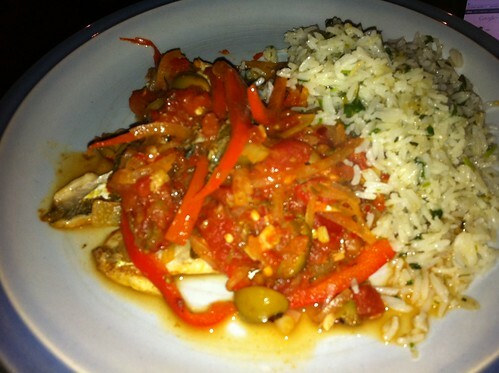 This Mexican baked fish recipe sounded perfect. It verges on being a store cupboard recipe and, when made with a thinner fish fillet, such as the mullet, is super speedy. Quantities below are for two people – assuming one fillet of fish each. Take your fish fillets and rub in some salt and lime juice. Set aside while you get yourself sorted. If you are using thinner fillets, you can get away with doing this all in the one pan, on the stove top. If you’re using thicker fillets, preheat your oven to 200°C. Heat some oil in the pan and fry the fish. Thinner fillets, you really want to cook the fish, thicker ones, just sear the fish’s skin side. Remove the fish from the pan. In the now empty pan, cook a single sliced onion until translucent. Add a crushed clove of garlic (or more, if you fancy) and cook for another minute or two before adding 200g (half a tin) of crushed tomatoes. Stir and then add half a red capsicum, finely sliced, a generous splash of water, and the juice of at least half a lime. Add roughly chopped green olives, capers and chilli flakes to taste (I used about 10 olives, about 1 tbsp of capers and a generous sprinkling of chilli). Allow this to cook for 10 minutes or so and adjust seasoning. You want the sauce to thicken up a fair bit, so you may need to cook for a little longer to evaporate off any extra liquid and to intensify flavours. When you’re happy with the sauce, return the fish to the pan and cover it with the sauce. Thin fillets – you are just heating through, but if you’re using thicker fillets, pop the pan in the oven to finish cooking the fish. We served this with coriander and lime rice (yes, that’s plain rice with lime juice and chopped coriander stirred through it – as I was using left over rice, I also gave it a quick fry up … delicious!) and an extra wedge of lime. The really important thing here is to not omit the lime juice. Really and truly. You can forget about the capers or the olives if they’re not your thing, or they’re not in the cupboard but you really CANNOT do without the lime. It lifts the dish and, I think, makes it feel Mexican. To drink: a cold beer would work, as would a lime-like Clare Valley Riesling. This was a super recipe, we all enjoyed it immensely. We used blue grenadier fillets which are a good price at the moment @ $12 kilo. We baked our fish and served the sauce over it direct from the pan. The sauce was delicious. We doubled the sauce recipe then stretched it to cover fish for 6 people. We don’t like a lot of chilli so used about half a teaspoon of chopped fresh red chilli. The lime rice was a great idea. Thanks again Alex. Ooooh, I see that a lot of your retailers are places that I either shop at or can get to easily so I’ll be keeping a look out for your products too!